The default RadChartView context menu can be customized in the ContextMenuOpening event handler. In order to add custom menu items to the default context menu, you should create menu item instances in the ContextMenuOpening event handler and add them to the e.ContextMenu.Items collection. 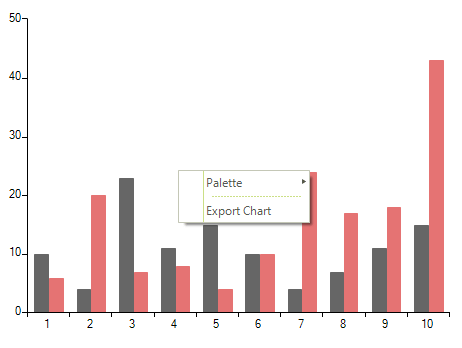 The following example adds an item responsible for exporting the chart to an image. Dim filePath As String = "..\..\..\exportedChart.png"